You might not fully understand what you are reading till you watch the video. I mean the mountain is inclined at a 45 degree angle, has 999 steps, and contains a further 99 turns. Heavens Gate is at the top of the mountain so you need to navigate all the way up there before you can reach it. 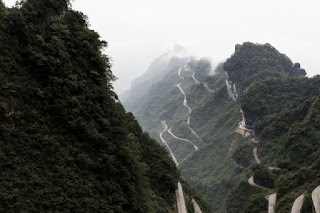 As if that was not enough, the length of the dangerous path is well over 11 kilometers. The road is so treacherous, it was infamously named the Chinese Dragon Road. For them to be able to complete the challenge, they first had to reinforce the RangeRover with special off-road tyres, then they got expert Panasonic Jaguar Racing driver Ho-Pin Tun to man the wheel. 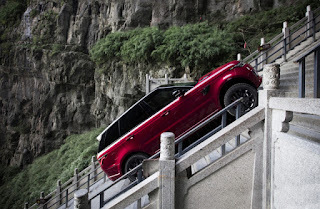 RangeRover wanted to prove that their Innovative Terrain Response System's Dynamic mode together with special on-road dynamics and off-road capability which are all present on the RangeRover are capable of conquering any surface on the surface of the earth. Needless to say they achieved their mission. In a record 20 minutes and 47 seconds. It is a record because the challenge had never been attempted by anyone before. This is not surprising as falling from an angle of 45 degrees, over 11 kilometers above the ground surface might result in certain death. After the ride here is what Ho-PinTun had to say "I’ve experienced Formula E, Formula 1 and won at the 24 Hours of Le Mans but this was without doubt one of the most demanding driving challenges I’ve ever faced." At least now, you know the vehicle to take with you to the wild.